What’s the Suggested Dosage of Vitafusion Melatonin? What Are the Side Effects of Vitafusion Melatonin? Does Vitafusion Melatonin Come with a Return Policy or Guarantee? How Much Does Vitafusion Melatonin Cost? Since 2012, Vitafusion has been under Church & Dwight. The latter is trusted manufacturing company with a reputation of excellence spanning over a century! They’re best known for the Arm & Hammer range of household products. Before that, the Vitafusion brand’s beginnings can be traced back to 1996. Its original makers first came out with children’s gummy vitamins as an alternative to what was then the very popular tablet form. Even then, what was important to Vitafusion was a great balance of taste and nutrition. Today, there are over 20 different dietary supplements in the Vitafusion line! Although Vitafusion seems to push their multivitamins and other supplements more, they do make several sleep aids. Apart from Vitafusion Melatonin, there are two more: Vitafusion Extra Strength Melatonin, a potent single-ingredient variant; and Vitafusion Beauty Sleep, a formulation with a beauty and wellness slant, that includes Vitamin D and Tart Cherry Powder. We reviewed Vitafusion Melatonin because it is the brand’s basic dietary supplement for sleep support. How does it stack up against others we’ve checked out? Find out below. Vitafusion Melatonin’s key ingredients are melatonin and extracts of Passionflower, as well as Chamomile and Lemon Balm. 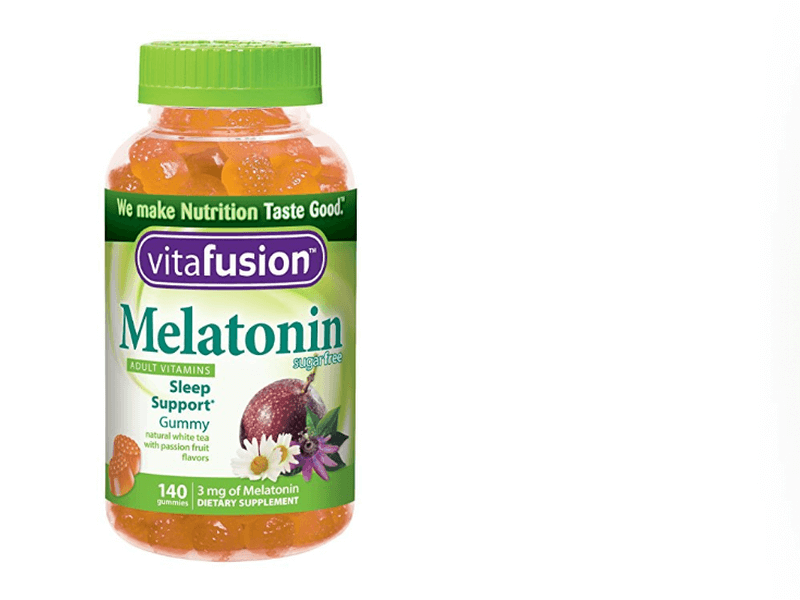 Vitafusion Melatonin is a dietary supplement sleep aid in gummy form. Its name can be misleading, but make no mistake. This is not just melatonin! The formula is particularly recommended for jet lag recovery. Unlike its industry counterparts, Vitafusion makes no big, detailed promises regarding sleep onset, quality or duration. They just a make the simple claim that it provides sleep support. Let’s get started on this review properly and take a closer look at these components. How may they help you sleep better? Melatonin is the star of this formulation. Though not a true sedative, it is a pretty popular ingredient in sleep aids. It is a hormone that occurs naturally in the body, and helps regulate your sleep-wake cycle. Chamomile and Lemon Balm are gentle herbs often added to sleep aids for their calming, relaxing properties. They are also likely to impart a sense of familiarity. Both are commonly taken as tea and widely recognized in plant form. Passionflower—the most uncommon ingredient of the four main ones—is a well-studied medicinal plant indigenous to North America. It is often paired with Valerian Root, St. John’s Wort, or fellow North American native California Poppy; though not in this blend. It functions as the main sedative of Vitafusion Melatonin. Apart from Key Ingredients, What Else Is in Vitafusion Melatonin? This dietary supplement uses sweeteners, tree nut product and porcine gelatin. The supplement is gluten-free and sugar-free. Why is it still sweet? It uses sweeteners Maltitol and Sucralose instead. Vitafusion Melatonin is also infused with natural passion fruit and white tea flavors. As for tree nut product, it comes in the form of fractionated coconut oil. You may be more familiar with the term “liquid coconut oil”—sold as kind of coconut oil that doesn’t solidify even in the fridge. This is actually due to the removal of lauric acid, an antimicrobial fatty acid with many medicinal uses. Why use fractionated coconut oil, then? It’s because this byproduct is actually a great carrier oil! People use it for essential oils all the time. In Vitafusion Melatonin, it may be used to “carry” the plant extracts in the formulation. Fractionated coconut oil is also known for its long shelf life, and it’s used to make gummies precisely to impart that stability to the final product. Is Vitafusion Melatonin Allergy-Friendly, Vegan or Vegetarian? Unfortunately, the answer is no to all three. The gelatin used is sourced from pork, and the gummies are processed in a facility along with products that may contain common allergens like egg, fish, shellfish and soy. Yes, porcine gelatin means gelatin sourced from pork! This is actually quite common. Apart from gummies, you can find porcine gelatin in many food products—ranging from marshmallows to margarine. The focus seems to have been to make Vitafusion easy to ingest as a chewable, tasty gummies; rather than to make it attractive to health buffs and people with many food sensitivities. Please do talk to your physician before adding Vitafusion Melatonin to your routine, especially if you are considering sharing them with children. We saw many cases of this in the customer feedback we combed through. Gummy supplements may look and feel safer than other kinds, but it’s important to remember that they are just tastier and easier to ingest. They may look like candy, but they are not. As with most sleep aids, it’s also better to be safe and avoid this product if you are: pregnant or nursing, suffering from a long term medical condition or taking prescription medication, or are otherwise prone to drug interactions and side effects. Vitafusion recommends taking two gummies right before you sleep. Don’t do anything that requires you to be alert after dosing. This includes driving, handling equipment, and operating machinery. However, Vitafusion does recommend that people brush their teeth after using their products, though sugar-free Vitafusion Melatonin may be a special case. Because they are flavored gummies, it can be easy to exceed the recommended dosage. We cannot stress this enough: It may look and feel like it, but Vitafusion Melatonin is not candy! While an overdose is not likely to be fatal, it can have serious consequences. You may throw off your sleep-wake cycle and make it even harder for you to sleep soundly. This product is explicitly stated to be for adults on the label. As we mentioned earlier, we saw that customers that post reviews online frequently mention giving this sleep aid to their children, but in smaller amounts. This was an alarming trend! Other similar brands have gentler formulations that are specifically marketed for children, so there is no excuse for this. While none of the key ingredients are outright risk factors for children if consumed, it’s never a good idea to go against instructions. Why take a chance like that? Again, please consult a healthcare professional before trying Vitafusion Melatonin or giving it to someone under the age of 16. We did a thorough search of customer reviews online, and there seem to be no widely reported side effects. Worth noting, however, that Vitafusion does not tackle this on their official website. In fact, it’s not mentioned even once in the FAQ. To be safe, people with severe allergies should not take this product. Again: Vitafusion Melatonin cannot be considered allergy-friendly, vegan or vegetarian. How Effective Is Vitafusion Melatonin? There are hundreds of reviews of Vitafusion Melatonin online, and it is rated high consistently; with an average of over four stars out of five in the three online marketplaces we checked: Amazon, CVS, and Walmart. It is generally worth it for the majority of those that use it. In the course of wading through about 750 separate reviews and comments, these were the standout remarks that we saw repeated over and over: the gummies taste great, they work and there’s no morning grogginess. What Are Vitafusion Melatonin Complaints? Customers have complained that the gummies don’t hold their shape and color well over time. Some also find the flavor off-putting. The positive response was overwhelming, but there are many widely repeated complaints, too. Again, a consistent thread in the reviews was the mention of giving these gummies to children, even though they are not suitable. We dismissed complaints focusing on child dosing issues as we do not endorse it in any way. Another common Vitafusion Melatonin complaint has to do with how long the product lasts in storage. Gummies can melt, get hard, stick together or lose their shape if not kept well. Proper storage should prevent Vitafusion Melatonin gummies from warping. Leave them in the bottle, in a cool and dry place. Some people experienced receiving brand new Vitafusion Melatonin bottles with melted or warped gummies inside. This was probably due to bad or faulty packaging and transport. Gummies also reportedly warped after being left out in the sun or somewhere similarly hot. You may also notice the gummies getting darker as it gets older. This is normal and it should not affect the potency of the product. Other complaints: Quite a few people didn’t like the fact that it was sugar-free! The sweeteners used ruined the taste for them. And, as usual, there was a chunk of reviews of the simple “didn’t work for me” variety. Where Can You Find Vitafusion Melatonin? Vitafusion Melatonin can be purchased online on Amazon, CVS, Walmart, and more. It is relatively easy to find because Church & Dwight is such a huge company. There is also a handy “Where To Buy” store locator available on Vitafusion’s official website, should you want to buy the dietary supplement at a physical store near you. Vitafusion products are made in the USA. That’s where the promise begins. As far as potential goes: Because Church & Dwight handles so many successful brands and has been around for so long, it’s easy to just put one’s faith in what they do and how they do it. Processes and practices are sure to be refined and efficient—made better with decades of experience and service. While being part of something so huge may entail a less personal approach, there’s still something to be said for an abundance of resources. Vitafusion, in particular, does it right. More than a promise, they have a commitment: Vitafusion has on ongoing partnership with the Fruit Tree Planting Foundation that allows them to help plant over 10,000 fruit trees to benefit different communities each year. What Quality Assurance Does Vitafusion Melatonin Go Through? Official statements on the website confirm that the supplements are regulated by the FDA, that the brand complies with FDA laws and regulations, and that they maintain current Good Manufacturing Practices (cGMP). 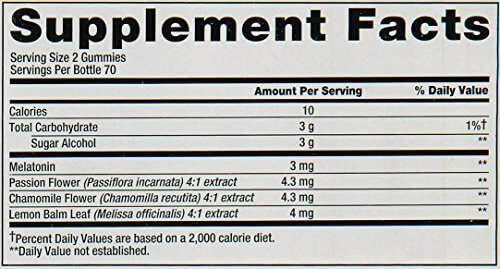 Labels on Vitafusion products state that the supplements are lab tested to ensure quality and potency. The details aren’t specified, but it’s being done. Unlike their newer, startup counterparts, there’s no excessive transparency. This can be good or bad, depending on what kind of customer you are. There’s no explicit assurance of third party testing, but this seems par for the course for a manufacturing giant like Church & Dwight. How Is Vitafusion’s Customer Support? Customer support is average. There is a contact form on the official website, as well as a toll free number you can call. They also maintain a Facebook page. This is where customer support seems to be strongest! The brand answers questions posted as comments to their Facebook posts all the time. However, they do not seem to be active on Amazon. Their FAQ and help section on the official website is also severely lacking. There is no return policy or money back guarantee for Vitafusion Melatonin. The lack of these may be because Vitafusion does not have an online store of their own. It could also be because not many look for a return policy or guarantee due to the affordability of the product. Note that Vitafusion Melatonin may come with a return policy offered and honored by the retailer you purchased it from. Usually, the price point of a Vitafusion Melatonin 140-count bottle is about or less than $10. These 140 count bottles go for different prices, depending where you buy them. As of this writing, though, $10 is the average cost. You should also make sure that you are buying a 140-count bottle! Currently, Vitafusion Melatonin comes in a bottle that holds 140 gummies, or 70 doses. Previous batches used to hold 120. Should you find a 120-count bottle that’s being sold at a lower price, note that it may be very old stock. No, this product does not come with a guarantee. It is very affordable, though! Compared to other sleep aids that typically cost between $15-$30 a pack or bottle, this is a steal. Definitely try Vitafusion Melatonin, especially if you are tired of having to take huge pills that are difficult to swallow. Try it if you prefer a fruity, enjoyable flavor with your supplements. Try it if the dusty, funky smell of natural supplements throws you off. Unless you have severe allergies, are vegan or vegetarian, or are otherwise medically unfit to use dietary supplements, there is no downside to trying out Vitafusion Melatonin.